With his creations that can be regarded as something between furniture and sculpture, the Hungarian master carpenter Antal Sprok who was born in Nagymágocs in the Comitatus Csongrád in 1955 reaches beyond the limits of creative and formal freedom that are attributed to pieces of furniture like cupboards and chairs by popular belief. In his work, he often draws on fairy tales, grotesque mythical creatures and the fantastic. The drawers, shelves and compartments he takes over in the extraordinarily elaborate fashion of a master craftsman from conventional furniture, are integrated in an almost organic manner in the animal or human forms surrounding them. From afar, this reminds the viewer of a burlesque adaptation of the artistic court carpentry of the Renaissance and Baroque periods whose ornately fashioned chests, goblets and containers could not only be used for valuables, but were also designed as small art chambers. The exhibition in Hirschwirtscheuer was organized in cooperation with the Hungarian Würth Group company, after the collector and entrepreneur Reinhold Würth became acquainted with the strange works of Antal Sprok during a visit to Hungary. Sculpture, furniture, sculpture-furniture. The artistic route and the wood-carved world of Antal Sprok belongs to a distinctive border of Fine Art. The nature of his artworks is binary, it is not only aesthetic, but also functional. To the aesthetical nature of the sculpture also belongs the practical part, the functionality as a furniture. While at the exhibitions the first part becomes stronger, at the milieu of the human home, the latter deepens. The two faces of the artworks strengthen the link between the real life and the world of fine art. The sculpture-furnitures are organic artworks, and this quality is depicted in the choice of the material, the way of putting into shape, in the content and in the way of usage. The source of the medium and the forms of the artworks is the landscape around us, with an extended understanding of the humanised nature. Sprok creates a personalized language of his own world of art, through the specific forms related to the different aspects of the environment. The serious flippancy, the anthropomorphised nature are mediated through distinctive, exotic woodtypes. The process of these materials shows different stages. Beside the sanded, painted surfaces, the dry-rotten, old wood pieces are also part of the artworks, and this appearance recalls the Hungarian 'retro-feeling'. The decorative nature of the surfaces is derived from the natural grain and texture of the wood, in which, the flora and the fauna are incorporated. The fairy world of the sculpture-furnitures, the curiosity of the form and the material inspire the viewer to touch, to build contact. The audience can contact the artworks, through the gentle sense of touching the objects, especially because the sculptures hide shelves, drawers, pigeon-holes. Into them, the audience, the user, can place their own objects. 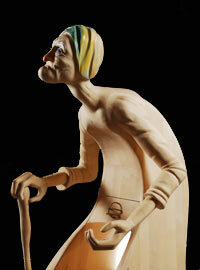 Antal Sprok carved and replenished a drawer of fine art, which galvanizes life into the static world of sculptures. From day to day, I suspected that the child still living in my soul would like to say something. One morning I awakened to feel that hi is not staying with me any more. I got frightened cause I had left the child, the secret of my whole life to myself and now he disappeared after all. I felt poor and broken-down. Then I inclined to hear my own voice of a child from somewhere. I turned where the sound came from. He waved to me from the third drawer of a beautiful, fairy tale-looking wooden statue. The child made his home there. I reduced myself as much as I could and climbed up to him. There was a wonderful home. He said this is a cassowary. But he grasped my hand and said we should set out, grown-up and child together, and see the statues, works of art, those conjured out of wood, a material most wonderful of all. Well, we started to roam around the fabulous, yet so natural world of Antal Sprok, the engineer, the artist, our one-time student. We were between friends, aging and young at the same time. Between faithful friends, since wood has from the very beginning symbolised faithfulness to mankind. Only those making something of very precious are allowed to use wood. Antal Sprok endows a unique, marvellous world with life with his professional skill and inexhaustible imagination. One must to love and caress his statue-like pieces of furniture, they often become members of the collective, of the family. Antal Sprok respectfully makes again living creatures from tree, the one-time living being after it had died. Resurrection of dead trees makes his art. Bunny and chameleon, dancing couple, camel, antelope, aging tree with its beetles, monkey going on a date, graceful birds, Desider in whom there is a semi-detached house, with front and back entrance, are all works of art of a wizard knowing and revering tree. And the lively, impish white mice, the wizard?s messengers. Indeed, it was time for the artist to finally move his works of art, pieces of furniture into a book. This artistic form unique even in the world of arts may reckon on devoted interest and affection. If you are reading the author?s statue-like pieces of furniture in this book, sooner or later you will start with your child self to forget everything and look at those wonderful shapes, beautiful wood surfaces, smart constructions and finally to move in some of them. With his book, with his works of art the artist enchants not only the wood but us too. Way back in the sixties when I was a teenager, I read a science-fiction novel. The story was set in the distant future, and at one point the protagonist, wanting to give a clear idea of someone's wealth, said: "He has real jewellery, made of wood." I found that really funny, for of course in the sixties it was metal, stone, leather or even plastic that symbolized real wealth; the word "wood" connoted moderation, even poverty. Over the years the hardness, the grain, the scent, the feel of the various types of wood were forgotten, and by the seventies the word "wood" designated colour only. Objects and implements made of wood became simply and solely products; we got used to the fact that wooden spoons were not necessarily made out of wood but could as easily be made out of plastic, which is squaring the circle rather. Since then wood has come back into fashion again, but our knowledge of it can only be recaptured gradually, shaving by shaving. That is why it is such an adventure to meet Antal Sprok and his creations. For whatever he makes - be it furniture, sculpture or sculpture-furniture - each piece is an initation into the mystery of wood. He creates striking, original, brilliantly executed pieces with an obvious reverence for the nature and dignity of his material. And - this is what I value perhaps the most in Antal Sprok - he never for a moment loses his sence of humour, his subtle irony, his playfulness. There is nothing sentimental about the things he creates; the sense you get is that he is completley at ease, contemplating the strange relationship between humans and objects with cheerful serenity. Let us just consider this creative method! His material is the most natural of all: wood. From this "flora" are born, in the shape of sculpture-furniture, Antal Sprok's strange fauna (lemur, cassowary, armadillo, chameleon), which in the moment of birth become part of a secondary "interior-nature". These delicately fashioned objects are centaur-like in nature, as their sculpture and furniture qualities are preserved in balance harmony. It is true that in the showrooms of an exhibition the sculpture function is stronger, but placed in a "living" interior, sculpture-furniture metamorphoses. You open a door, take out a piece of clothing, pull out a drawer and finally find the pipe-cleaner you've been searching for days. And in the meanwhile an intimate relationship is formed between you and the creature incarnated in the sculpture-furniture - be it animal or human. A bizarre intimacy. Nature and human nature. These impressions, these sensations make it really worthwhile to visit Antal Sprok's animal, vegetable and human garden.